Blackman & White look to the future of British manufacturing at Sign & Digital UK 2015. 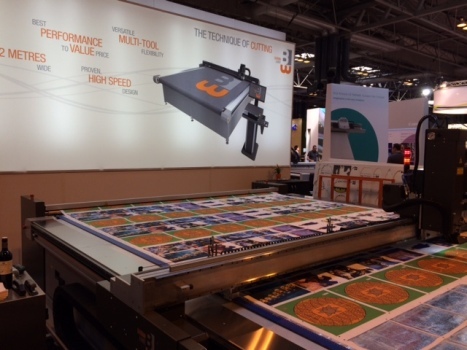 B&W Sign UK UK-based specialist manufacturer Blackman & White (B&W) showcased its flagship 3.2m wide Versa Tech cutter at Sign & Digital UK 2015, in what it described as a demonstration of the best in British innovation and engineering. This was the official launch in the UK for the Versa Tech, designed and manufactured by B&W from its base in Essex. The Versa Tech is the most recent addition to its MasterCut range, and it offers tool versatility and accuracy, with crease, kiss cut, router, drag knife, oscillating knife and driven rotary knife and laser all available on a single conveyorised or flatbed heavy-duty table. Explaining the company’s history, Managing Director Alex White said: “We’ve been supplying cutters to the marine and boating industry for more than 50 years now, and we moved into sign and display around 10 years ago when a sign company approached us to develop a laser cutter for use on textiles, and we’ve never looked back. “Over the last few years, Blackman & White has developed from being a company that manufactured bespoke cutters for individual client needs, to developing and manufacturing cutters that are still tailored to the industry, but built in much higher numbers. B&W is the only UK manufacturer of large format cutters for the sign and display industry, and British companies in particular see the benefit of getting service and support direct from the manufacturer, who is – in global terms – just on their doorstep. However, while B&W is a UK manufacturer, around 60 per cent of their machines last year were manufactured for the export market, and they now have around 800 machines installed worldwide. “The textile print market is continuing to grow at a faster pace than any other media in the sign and display market, and that’s where our laser cutting option really comes into its own,” added Alex. “In such a diverse and innovative industry, you need great creative thinkers with fresh new ideas, and we’re always looking for ways of bringing in new blood, often taking on people directly from leaving university and into apprenticeships. The Versa Tech is modular, and customers are able to purchase one tool initially, and then add others over time to meet increasingly varied production needs and spread the cost. Dual driven tooling with interchangeable ‘drop-in’ tools, both oscillating head and driven wheel, allows for easy and quick change of cutting technique. 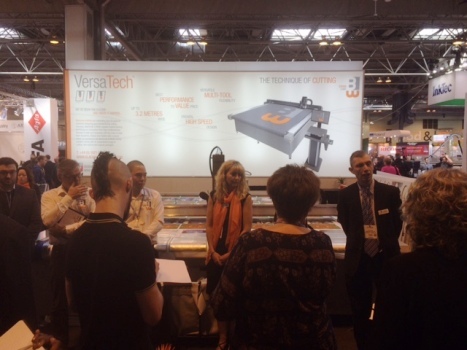 The Versa Tech is able to cut widths up to 3.2m, and to carry out long production runs on heavy duty materials such as acrylics and DIBOND, all down to the addition of a 2.5kW water-cooled router. There is also a 100w laser option for textile cutting. It offers high-precision, top quality output and B&W maintain it offers a fast return on investment. The machine runs on a linear rack, keeping costs down as no belt replacement is needed, and ensuring accuracy is maintained over time.